The Mesa Boogie Mark Series is a series of guitar amplifier made by Mesa Engineering (more commonly known as "Mesa/Boogie"). 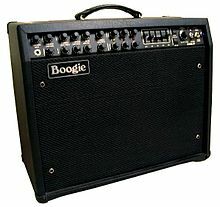 Originally just referred to as "Boogies," the product line took on the moniker "Mark Series" as newer revisions were put into production. The Mark Series amplifier was Mesa's flagship product until the introduction of the Rectifier series, and the amplifiers are very collectable. Randall Smith began Mesa/Boogie with a practical joke: he borrowed a Fender Princeton (a small 12-watt amplifier) from his friend, Barry Melton of Country Joe and the Fish, and "hotrodded" it by replacing the amplifier section with a powerful Fender Bassman amp and installing a 12-inch speaker instead of the original 10-inch. The resulting amplifier proved to be loud and successful, and Smith made more than 200 of these Princeton "Boogies"—a name allegedly provided by Carlos Santana, who is to have exclaimed "Man, that little thing really boogies!" A second important improvement was in developing an extra gain stage for the guitar input. Smith added an extra tube gain stage to the preamp, with three variable gain controls at different points in the circuit (this is now called a "cascaded" design), creating the first high-gain amplifier. He set about designing a guitar amplifier around the new principle, and in 1972 the Mark I was released. One of the more notable amps in the series was built in 1977, with serial number A804: this is the amp built for Keith Richards, the first one in a long collaboration between Smith and the Rolling Stones, a collaboration which started somewhat inauspiciously when the Stones manager asked Smith for some free amps ("We're the Rolling Stones; we don't pay for amps"), and Smith refused. (Richards had played Santana's Boogie and decided he wanted one too.) Finally, Smith talked to Richards and they agreed that he would send them an amp, and that the Stones would pay for it or return it. Richards ended up using the amp for the El Mocambo show (as one of six), and the Stones, over the years, received and paid for over forty of Smith's amps. The first Boogies are referred to as Mark I's, though they were not given this name until the Mark II was released. They were 60 or 100 watt combo amps with a 12-inch speaker, primarily Altec-Lansing 417-8H Series II. The Mark I had two channels: The "Input 2" channel, voiced like the Fender Bassman, and the high gain "Input 1" channel, which produced the overdriven "Boogie lead" sound used most notably by Carlos Santana on side 2 of Caravanserai, and by The Rolling Stones' Keith Richards and Ron Wood, who used the amps live and in the studio from 1977 until 1993. Examples of this amp in its original form and in good condition are sought after by collectors and guitar aficionados. Reverb was optional, and not present on many early Boogies. Later, Mark I models were available with reverb and/or graphic EQ. The S.O.B. was introduced in the Mark II era. This was Mesa/Boogie's first attempt at having a reissue of the Mark I. It had two cascading gain inputs and its controls were Volume(gain) 1, Volume(gain) 2, Master, High, Middle, Low, Limit or Presence (depending on the version). No foot-switching available, however an A/B splitter pedal could be used to select input 1 or input 2 separately. There was also a reverb option which replaced the Middle knob with the reverb control knob. These amps had a point-to-point wired power section and had large transformers with great headroom, even in 50 watt trim. SOB chassis were shared with other heads, but had different front and rear plates. EQ, slider cutouts and other 1/4" jack cutouts can be seen from inside the chassis. The Mark II introduced channel footswitching. It was not referred to as the "Mark IIA" until the Mark IIB was issued. It was also available as a head (a standalone amplifier), which could be hooked up to a number of different speaker combinations, although a 1x12" cabinet was the most common. The preamp gain on the Mark IIs occurs after the tone controls and so, according to Mesa/Boogie, the IIA has a "tighter, more focused sound" than the Mark I. The Mark IIA's control panel was extended from the Mark I's to include a separate master volume control for the lead mode, and various push/pull switches including Pull Bright, Pull Treble Shift, Pull Gain Boost, a separate Pull Bright for the lead mode, and of course, Pull Lead. The 1/4" jack previously marked "1" was changed to just "Input," and "2" was changed to "Foot Switch." The Mark IIA was a great improvement over the Mark I, however it had a few major flaws that it received criticism for among collectors. The new footswitching system relied on a relay, which made an audible popping noise when switching modes. The reverb circuit was also noise-ridden on some models. The IIA and IIB, and some late-model Mark I amps, used a JFET-based device called fetron in place of the input stage 12AX7 (V1), and included a switch for configuring the amp for either Fetron or 12AX7 operation. The reason for using a fetron was to address some of the problems associated with microphonic 12AX7 tubes in a high-gain situation; its use was later discontinued as newer production tubes were able to withstand the extreme conditions within the amplifier. The Mark IIB is credited as the first guitar amplifier with a tube-buffered effects loop. However, the loop was placed between two critical gain stages, and tended to overdrive some instrument level effects, and also caused volume pedals to act as remote gain controls for the lead mode. Mesa later implemented a mod that caused the effects loop to become more transparent, and smoothed out the lead channel, similar to the IIC+'s lead channel. More importantly, it marked the introduction of Mesa/Boogie's "Simul-Class" system, where two of the power tubes (always 6L6s) run in class AB pentode while the other two tubes (either 6L6s or EL34s) run in class A triode. In a simul-class amp, running all four tubes generates approximately 75 watts RMS of power; running only the class A tubes produces about 15 watts. Also available were non-simul-class Mark IIBs in both a 60 watt version and a 100 watt version that allowed shifting down to 60 watts by turning off a pair of power tubes. The Mark IIB's front control panel is identical to that of the IIA. The two input jacks on the front panel are marked "Input" and "Foot Switch." The front panels read Volume, Treble, Bass, Middle, Master, Lead Drive and Master. It has "Pull Bright" on the Volume, "Pull Shift" on the Treble, and "Pull Bright" on the Master. The Rear control panel was altered to accommodate the FX Send and Return jacks. The Mark IIC finally remedied the two major problems of the IIA and the IIB: the previously noisy reverb circuit and a footswitching system that produced a popping noise when activated. The Mark IIC featured a quieter footswitching system based on optocouplers to reroute the signal, and a new mod to the reverb circuit. The reverb modification involved resistor swaps and a change in ground lead placement. That mod[ification] is still on the books of 'official' mods, which they send to their authorized techs; it runs about $50." Mesa/Boogie no longer does this modification at its own factory. The Mark IIC also featured a new Pull Bass shift on the front panel, which slightly extended the low frequencies in the preamp. The Mark IIC+ was the last of the Mark II series and featured a more sensitive lead channel - due to its featuring a dual cascading drive stage - whereas the IIA and IIB had a single-stage drive circuit. The IIC+ also had an improved effects loop. Unlike earlier Mark II models, pedals configured for instrument-level input signal could be used without the amp's signal overloading their inputs. However, the volume pedal option on the Mark IIB cannot be implemented on Mark IIC+s. Some owners/dealers/sellers say the "+" refers to an amp having an EQ, but they are mistaken. The mistake may have originated in the mid 1980s, when Mesa/Boogie issued their Studio .22 model and then changed the name to Studio .22+, which featured improved wiring, etc. All the Mark II models could be made with EQ as an option, but not all of them did. A Mark IIC+ could, for example, refer to a 100 watt amp without EQ or reverb. One can tell if a particular amp is a "+" by looking for a hand-written black "+" mark directly above where the power cord attaches to the back of the amp. Many dealers increase the price on a Mark IIC+ but often don't know anything about what the "+" means - they often don't even know where to find the "+" mark. Indeed, the mark itself can be forged. An owner can call Mesa/Boogie and ask them to check his or her serial number against their records. Mesa/Boogie only made about 1,400 Mark IIC amps before moving to the Mark IIC+. Another cosmetic way of distinguishing a IIC from a IIC+ is the front panel. A IIC has the traditional "Gain Boost" pull switch integrated into the master volume, while a IIC+ replaced the switch with a Pull Deep bass booster. Some Coliseum series IIC+s retained the surplus "Gain Boost" faceplates, though. IIC+s upgraded from earlier IICs also retain their original Gain Boost faceplates. However, there are some very early "transitional" C+s (in the 133xx range) with gain boost on the panel, but it works the same as the pull Deep on the later versions. 1) Plug your guitar into the Effects Return jack 2) Switch to lead mode 3) Turn the Lead Drive and Gain controls with a note ringing. 4) If they have NO effect on the volume and sound you have a “+”. This method should remove all doubt as to whether the preamp circuit board is a IIC or a IIC+. The Mark IIC+ is currently the most coveted vintage Boogie, selling for twice its original price on average, because of its much praised "Liquid Lead" mode, and also its warm, clean rhythm mode. 12 Factory C+s with switchable ++ are known to exist, before this idea was use in the Mark III, with the ++ being developed further to become the R2 channel on the III. The Mark III was launched by Mesa/Boogie in 1985. It introduced a third channel, a "crunch" rhythm sound right in between the rhythm and lead channels. This amp has a dual footswitch system: one footswitch alternates between the current rhythm mode and the lead mode, and the other selects either the clean rhythm mode or the crunch rhythm mode. The two rhythm modes share all of their controls, while the lead mode only shares the rhythm modes' tone stack, featuring independent gain and master volume controls. The physical switch for the crunch rhythm mode was implemented as a push/pull switch above the Middle frequency control. Most Mark IIIs have presence and reverb on the back (except for long chassis') unless not desired by the buyer; Graphic EQ was also optional all in either head or combo format. The Mark III went through multiple revisions, similar to the Mark II. Each revision had a slightly different voicing, but identical functionality. Non-Simulclass versions of the Mark III came in either 60w RMS with two 6L6s or 60w/100w with four 6L6s in the power section. Mark IIIs contain either four or five 12AX7 tubes in the pre-amp section, depending on if they have the reverb option. Simul-class Mark IIIs usually contain two 6L6s in the inner sockets and two EL34s in the outer sockets for 15w/75w use. These are distinguished by either the absence of a marking, a black dot, or a black marker stripe above the power cord entry. Early 100W and Simul US Voltage Black Stripes retained the same 105 power transformer as the IIC+, which is easily distinguished by its larger physical size than the later-introduced Mark III transformer. IIC+ non US voltage export power transformers and IIC+ output transformers are also seen in these models. Most Black Stripes also re-used the faceplate from the Mark IIC+. This resulted in the first pot being labelled with Volume 1 in instead of the later Volume label. Furthermore, the pull function label above Middle knob was hand-etched onto the face plate resulting in a slightly different look than the other labels on the faceplate. Towards 1986, a new PCB revision was installed which enabled an additional component to be switched on when R2 was activated. This board was re-used in the Purple Stripes, although with a different revision number and different lead circuit component values. The third revision was the "Red Stripe" Mark III which featured a red marker stripe above the power cord. The amplifier had lead mode circuitry almost identical to the IIC+ and some minor changes in the preamp to make it similar in circuitry to a IIC+. A further PCB board revision with revised R2 channel was introduced which forces Treble Shift on when in R2 mode. The power circuitry and presence cap remained identical to the previous stripes however. The final revision was the "Green Stripe" Mark III, which was only available in a Simul-Class format. It was identical to the Blue Stripe, apart from having its overall gain reduced, except for the wiring of the outer two Class A power amp tubes which were switched to Pentode operation instead of Triode for a 10w RMS increase over previous Simul-Class amplifiers (15w/75w) making 25w/85w. Mesa ultimately ended the Mark III's production since it overlapped with production of its successor, the Mark IV, which was introduced in 1990. Mark IIIs were still in steady production around 1994, and finally ceased as late as 1997, 11 years after its launch. The Mark IV was launched by Mesa/Boogie in 1990 as a three-channel amp - with independent controls for all three channels, except bass and mid, which are the same for both Rhythm 1 (clean) and Rhythm 2 (crunch). The "crunch" channel is designed for use by hard rock and heavy metal rhythm guitarists. There were two versions of this amp. Mark IVs built from the start of production until about September 1993 are referred to as version A; amplifiers made from late 1993 until the end of production in 2008 are known as version B. Early Bs have an attached power cord, like the A version. Some differences: version A has no footswitch for reverb or stereo effects loop, and the lead channel is much like the Mark IIC+‘s. Version B has switchable reverb, a single switchable stereo effects loop, and an output to drive another power amp. Its voicings are altered slightly. Another distinct difference in the "B" version, is the low voltage power supply. This section is susceptible to catastrophic failure. It is a result of electrolyte leakage, from the filter capacitors Mesa used in the low voltage PSU. The leakage will cause erosion of PCB traces and component leads. The close proximity of these components, to the power amplifier bias resistors, can result in failure of power tubes and it's associated components. The repair process is extremely difficult and time consuming. Even with these shortcomings, the Mark IV's are in terms of sound, one of Mesa's best. Both versions are highly regarded; production of the Mark IV ceased in 2008. The Mark V was introduced in early 2009. Much like its close cousin, the Triaxis Preamp, it features many voicings based on previous Mark Series amplifiers. It has three distinct channels, each with their own pre-gain three band tone stack, gain, master, and presence controls. Each channel also has three modes, which control several of the amplifier's 49 relays to mirror the circuit being modelled. The Mark V introduced a channel-assignable graphic EQ. Older Boogies were equipped with graphic equalizers, but these did not allow the same flexibility. Each channel has a toggle switch able to select between EQ active, off, or footswitched. Similar to the Express and F-series amplifiers, the graphic EQ also had channel-assignable contour knobs. The Mark V - like its predecessor - comes standard in a Simul-Class format, but with a twist: early Simul-Class power amps were configured for SC-75 watt operation, or A-15 watt operation, or an increase of 10 watts when in pentode mode. The Mark V is biased warmer to produce an output of SC-90 watts, AB-45 watts, and Single-Ended A-10 watts, similar to the Lone Star. Channel-specific Multi-Watt toggles dictate the power amplifier's operation class. The Mark 5:25 was introduced in 2014. It is a smaller, two-channel version of the Mark V. The output section contains two EL84 tubes which can be switched between 10 and 25 Watts. It also features a built-in CabClone which can be used to emulate a speaker cabinet while driving headphones for silent playing, or a direct-in (DI) box for recording or sound reinforcement applications. The Mark 5:35 was introduced in 2015. It is based on the Mark 5:25 and features two channels. The output section contains four EL84 tubes which can be switched between 10, 25, and 35 Watts. Additional solo controls were added for independent volume switching. It is also available as a combo and a head. The combo is a similar size to the Mark I combo. It also features cab clone. The JP-2C was introduced in 2016. It is a 3-channel 100-watt "revival" of the Mesa Mark IIC+ designed in part with Dream Theater guitarist John Petrucci, who is well-known for using a Mark IIC+ in the studio. The three channels are based upon the original channels of the Mark IIC+, but with two identical gain channels based on the IIC+'s lead channel. It also features two separate graphic EQs, which can be selected for each channel via mini toggles on each channel's front panel. It is also the first Mesa amp to feature MIDI connections, which can control the channel switching, as well as controlling the FX loop and graphic EQs. Much like the Mark 5:25, the JP-2C features a built-in CabClone. The amp also features a switch to drop the amp's wattage down to 60 watts for use in smaller venues or recording. ^ a b Gallagher, Mitch (2012). Guitar Tone: Pursuing the Ultimate Guitar Sound. Cengage. p. 251. ISBN 9781435456211. ^ Chappell, Jon (2011). Blues Guitar For Dummies. John Wiley. pp. 288–89. ISBN 9781118050828. ^ Hunter, Dave (2012). "Circa 1977 Mesa/Boogie Mark I". Amped: The Illustrated History of the World's Greatest Amplifiers. Voyageur. pp. 182–83. ISBN 9780760339725. This page was last edited on 10 March 2019, at 14:29 (UTC).